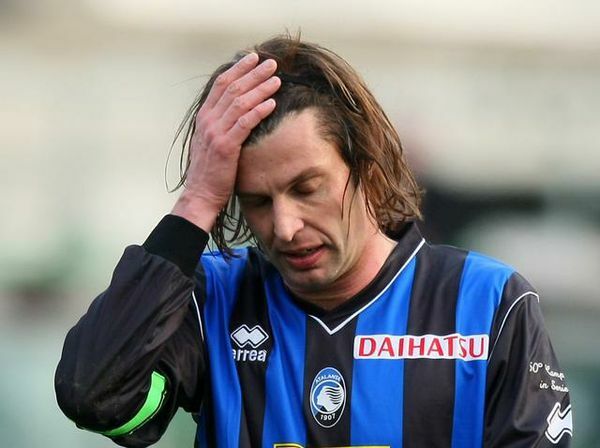 Let's take a look back to almost exactly six years ago, when former Atalanta and Italy midfielder, Cristiano Doni, found himself in legal trouble. He was said to have been hiding in his garage, trying to elude the police when they came. By then, it was vain protest, the type of tragicomic defiance that often precedes the arrest of mobsters in Italy. Cristiano Doni is no mobster, but the way the police escorted him out in the night from his home had the resonance of high-profile disgrace. Doni appeared briefly in the warm light of his home, but as he walked out, impassive policemen all around him, he became a shadow against the stone and chalk of walls. And then he disappeared into the dark. At thirty-eight, Doni must have thought things would be different. The man with the almost perpetually bedraggled hair never saw his career in Italian football reach the pinnacle, but it has now reached a nadir. He was already banned in the summer for three and a half years for his part in a match-fixing scandal, even if his involvement was overshadowed by that of Giuseppe Signori, the former Lazio, Bologna, and Italy hero, and by all accounts, as far as football people go, the man at the forefront of the iniquity. Doni, the Atalanta hero, was supposed to end his career in the brightness of Serie A, after his twelve goals in Serie B last season helped promote the club from Bergamo. With his arrest, such things must seem like distant luxuries. Doni was arrested as part of an investigation that has seen sixteen other people arrested for a match-fixing scandal that involves betting rings and stakeholders as far as Singapore. There are some Serie A games from last season under suspicion as well. "This is just the beginning," Roberto Di Martino, the Cremona prosecutor, said ominously. Indeed, it may be. For Doni, though, it is an inexorable end. More than five years after Calciopoli, Italian football is still purging its rogue elements, which are so pervasive that you cannot help but be cynical about the entire administration of the sport, and Doni will long be remembered as one of them. Doni would be included in Italy's dismal World Cup 2002 as well. However, even from that wreckage, he salvaged much more credit than Totti. Italy's controversial group stage 2-1 loss to Croatia is remembered for egregious officiating, but Doni brightened the game by providing an assist for Christian Vieri with a cross and setting up a goal that should have stood. The non-goal came from a moment of brilliant improvisation. With Zambrotta lurking in the box, Doni provided him an expertly weighted lob, and Zambrotta flicked it on at full stretch for Vieri to head in. The goal was incorrectly ruled offside, but Doni proved with his swift thinking that he was not awed by the occasion. He started that game in a midfield that contained Zambrotta, Damiano Tommasi, and Cristiano Zanetti--Totti was to play further up front, closer to Vieri--and he played with a remarkable level of boldness and ease. Though he was substituted by Filippo Inzaghi about ten minutes from the end, the move was only Trapattoni's panic response to going 2-1 down. Italy did prove the culmination of his career in some ways, but Doni could have also made a significant mark at club level beyond Atalanta had he been picked up by interested clubs such as Inter or Juventus after the 2001-02 season, during which he was under the tutelage of coach Giovanni Vavassori (now at Verona). However, for various reasons, the moves never materialized. Instead, he turned out to be one of Italian football's nearly-men. He started his club career at Modena, before moving onto Rimini, Pistoiese, Bologna, Brescia, Atalanta, Sampdoria, Mallorca in Spain, and finally Atalanta again. It was at Atalanta where he was to score over 100 goals, and make almost 300 appearances. It was at Atalanta, however, that he would earn both fame and shame. He has always been adored by the club's fans, but his arrest may have pushed them to the brink. In many ways, they probably saw the recent debacle coming. In 2000, Doni was also suspended for his role in match-fixing, involving a Coppa Italia game between Atalanta and his old club Pistoiese, who were then in Serie B. But the punishment did not restrain the man. Instead, he is now in the dock once again, and this time he has no chance to restore his image. For a man who showed such patience in his career, it is a shame that he attempted to circumvent the honest road right at the end. That, and not his undeniable skill, may well define him in the end. Oriundo (not even): Another pleasure to read. I thoroughly enjoyed how you began with the end of Doni's career and weaved the match-fixing scandal into the larger timeline of his professional life. I look forward to see what your memory revisits again.